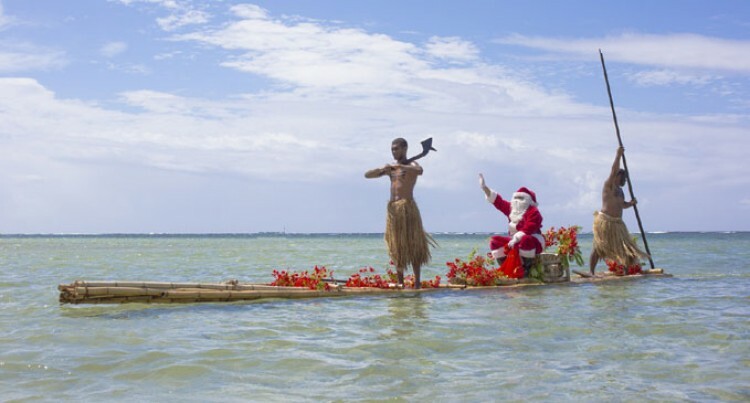 The sun was shining and the sea was sparkling as Father Christmas made his way to shore at Outrigger on the Lagoon Fiji in his very own bilibili, accompanied by two mighty Fijian warriors. The children waiting for him on the beach could not believe that Santa Claus had found them Fiji. Young Blake from Melbourne, Australia asked Father Christmas if this was his first visit to Fiji, to which Santa Claus replied that he came every year. After taking many photos with the children, Santa Claus proceeded to the Kids Club Bure where he gave the children gifts. The children then took part in smashing up the ginger bread house especially made by the resort. Christmas is also a time for giving, with a large number of guests visiting our local villages and taking gifts along for the children, he said.